Saturday is one of my favorite days of the week. 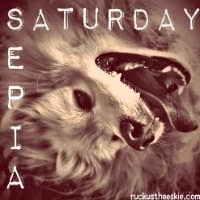 Not because it is the weekend, but it means Sepia Saturday hosted by Ruckus the Eskie. Thanks Ruckus! My choice for today’s photo is a bit different from my usual ones. My husband took one of my favorite old photos of us when we were dating in 1981 and added a recent photo of us standing behind the young us. The result was astonishing. Not just because we are 30+ years older, but it looks as if we are actually in the original photo. One thing is certain…time passes but true love remains. Have a fun weekend and enjoy hopping to these other great blogs. Now that is really neat! Love it! That is seriously cool!! Happy Sepia Saturday! He did a great job photo shopping that photo. You guys look very lovely and so much in love. Thanks for sharing. Thank you so much! He is my Photo Shop wizard and does really neat things. Yes, we have been truly happily married for 32 years. Love this photo - at first glance I thought oh, it's an old picture of you with your parents...and then I read your explanation! Hubby did a great job. Omg! He did such a good job! Until I read that all 4 of those people were you guys I had no idea! LOL!! Great idea for sepia saturday and very sweet to! Hahaha! You never realize how much 30 years changes the way you look until you put yourself in a photo of a younger you! How cool is that? I LOVE this!!! Aww, thanks! I am glad that you dropped by to see it. LOL! Thanks, I love it too. 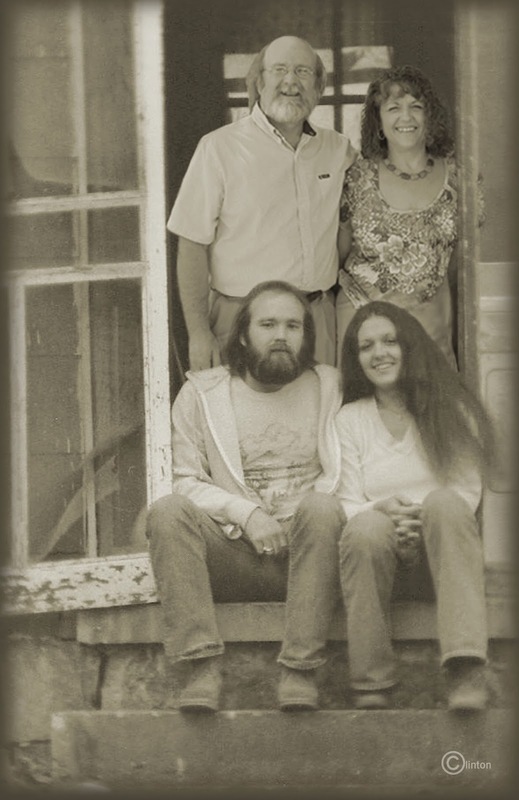 The first time my daughter saw the original photo of us sitting on the porch, she said, "OMG! Y'all were hippies!!" Hahahaha!! That is so neat! When I first looked at it, I thought it was a family photo lol so he did a great job. WHOA WHOA WHOA. You two look amazing in 1981 and amazing NOW! My sapiens and I thank you for sharing because it touched our hearts. Happy Sepia Saturday! Ruckus, I officially love you now! LOL! I'm so glad that you enjoyed it. Wow! This is so cool! He did an incredible job. So so cool. You two look great then and now! Thanks Leiah! Gravity happens! ROFL!! Hahaha! He has become very proficient in using PhotoShop! I am very lucky since I have him doing all sorts of fun things with photos. If you get a chance, check out some of the things he has done on my author Facebook page! http://on.fb.me/1bfaBvY Thanks for your sweet comments! Nice photo and a great idea! What a cool photo, and such a creative idea. You both look great too, and so happy. Over 30 years together is wonderful! Wow - what an awesome idea for a photo! Very cool.